As a leader in Real-World Learning education in Chicago, ChiTech hosted a group of attendees from the Schools That Can Forum. 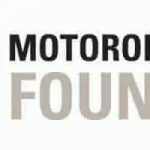 The annual forum was held in Chicago this year on May 2-3. 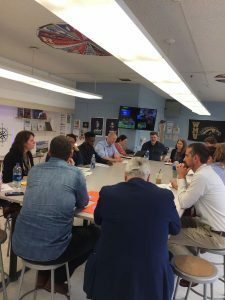 School principal, Linnea Garrett, led a small discussion where she explained ChiTech’s mission, project-based learning, the senior internship program, and more. ChiTech was selected as one of the few schools in the Chicago Public School system to be toured during the conference. As a trailblazer in project-based learning and real-world learning, ChiTech was the perfect fit for the STC mission. Is the largest cross-sector network of urban schools in the country. Empowers the leaders in their network to expand Real-World Learning across their school. Develops teachers’ skills and capacity to plan and facilitate Real-World Learning in their classroom. Engages students directly in hands-on relevant, Real-World Learning. DeAndre Allen is a recent ChiTech alumnus who started working with Schools That Can to pursue his passion for educational equity. 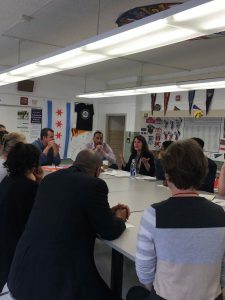 He says, “Being a former Chicago Public School student, I think Schools That Can is really trying to come in and help our network of 28 schools tackle and grow in their areas of Real-World Learning”. As a product of ChiTech, Deandre can attest to the success rate of Real-World Learning. The senior internship program at ChiTech uses Real-World Learning to prepare seniors for life outside of high school. This past winter, ChiTech revamped their senior internship program where each senior was placed with a company in the winter as opposed to the spring. This allowed more time for reflection before graduation. The life skills the seniors learn in an office environment first-hand are invaluable post-graduation.